I’ve been a “bare down there” girl since the first piece of hair sprouted and I feel like it hasn’t been until the past 2 years that Razor companies have actually 1-up’d for girls. I’ve just always purchased men’s razors since it seems like every time they decide to “add another blade” for the ultimate shave they upgrade men’s razors first. You have to be pick and choose-y until you find multiple tools just to get the perfect maintenance trim down there. 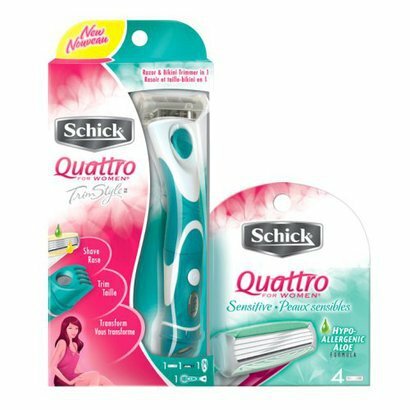 I just recently got a recommendation from a friend right now, who swears by Schick® Quattro TrimStyle Razor for Women. It’s a two in one that has a 4 blade razor and a trimmer on the other end. They didn’t even have the massive chunks of “moisturizing” crap that make your legs or vag feel like you cut open an aloe vera plant and have it snail trail next to your razor. Best of all the worlds!